The last Friday of the month: payday for nearly everyone in Thailand. Flush with money and full of a desire to spend it, Thais take to the streets and go to the shopping and entertainment districts. 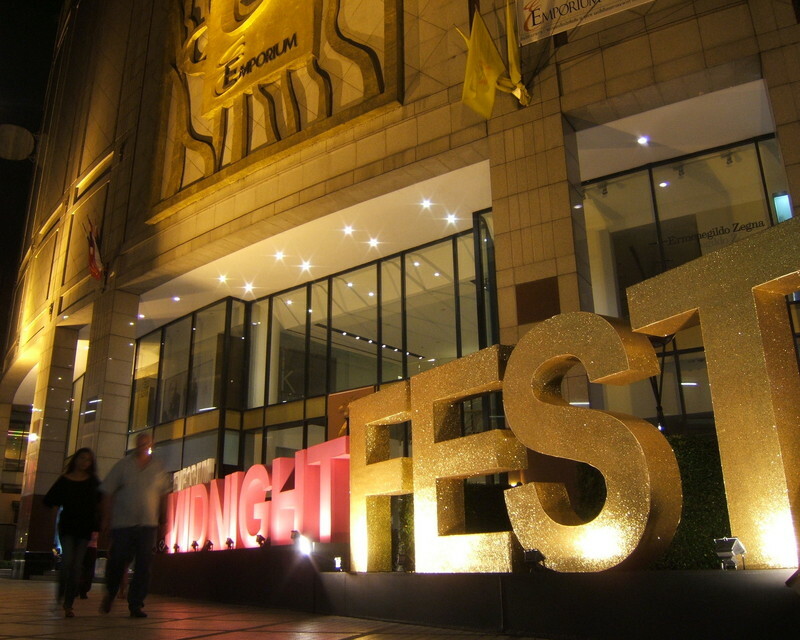 Roads, especially ones like Asoke that lead up to the Ratchadapisek entertainment area, are packed from early until late. Malls and shopping centers stay open late for heavily advertised midnight sales complete with live entertainment providing everything from swing bands to DJ-spun electronica. Tawn returned to his parents’ house to celebrate his father’s birthday, which is this coming Sunday. I’ve mentioned before in these pages that Tawn’s father has a very tenuous relationship with me, best described as “don’t ask, don’t tell” or maybe, “if I close my eyes really tight, maybe when I open them again this nightmare will be over and the farang will be gone”. 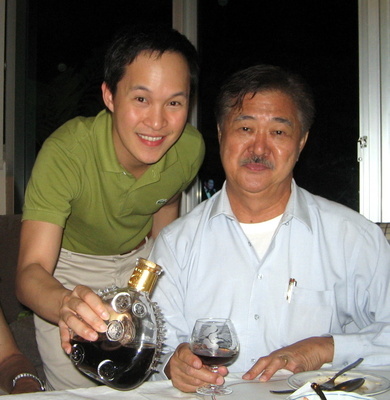 Left: Tawn serves his father a glass of cognac that Khun Sudha uncorked Friday night after saving it for twenty years. I asked Tawn to wish his father a happy birthday from me. He said he would, but I always wonder if he actually says, “Dad, Chris wishes you a happy birthday, too” or not. While Tawn was at his parents’ house, I ate a bite of dinner at home, did some exercise (30 minutes of yoga using a Bryan Kest DVD), and then headed to Emporium to watch Fracture, the Anthony Hopkins and Ryan Gosling film. While it is a good film and a fine performance by Sir Anthony, the conclusion of the movie was a little too neat. Wouldn’t it have been so much better if, unlike the typical American film, it was left a little unfinished? Anyhow, when I exited the cinema at 11:30 I was surprised to find that the mall was still busy. It hadn’t really occurred to me, despite the 2-meter tall sign in front of the mall, but this midnight sale stuff is really serious. Since the supermarket was open, too, I picked up some groceries before heading home. So convenient! Saturday morning is a meeting with Ble, our designer, and his contractor. Hopefully we’ll make some progress on this condo redesign. Rainy season must really be here. 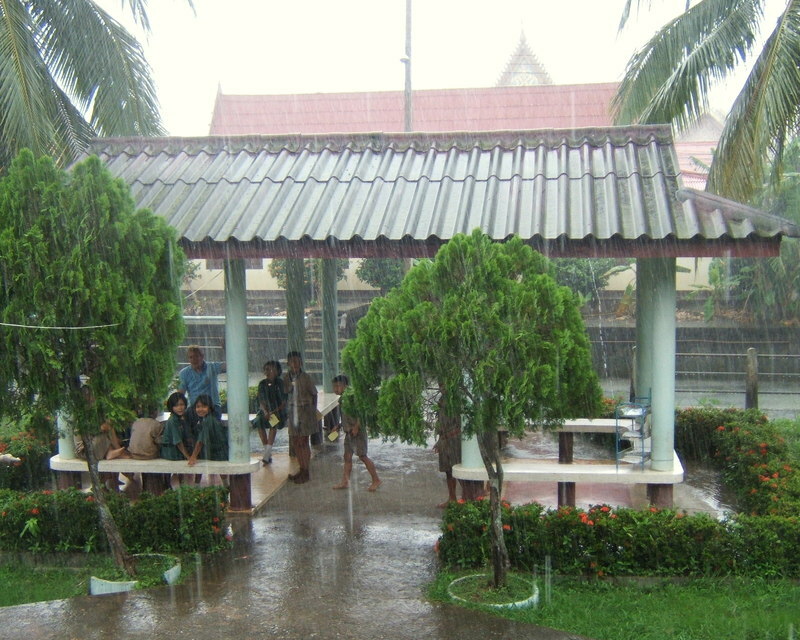 Over the past few days it has rained a bit in the morning, rained a bit in the afternoon, and rained a bit in the evening. Thankfully when I met Brian for lunch on Thursday most of the torrential parts of the rain happened while we were in a restaurant. Since I had to run an errand up to the Soi Ari area and didn’t want to cross the city to get back home I just camped out at Starbucks (having a decaf latte as part of my attempt to significantly cut back on my caffeine intake) and edited three documents for work. Sometimes one can be productive without a computer, hard as that is to believe. About 5:30 Kobfa met me and we went to the Foreign Correspondents’ Club to watch the 2002 Argentine film El Bonaerense by Pablo Trapero. “El Bonaerense” is Argentine slang for both the residents of the provinces surrounding Buenos Aires as well as for the city’s police officers. It is a gritty film about the thin line between cops and crooks. The Argentine Ambassador, who is a big film buff, personally selected the movie from his collection and in his introductory remarks told us he chose the film because it provided an interesting comparison between Thailand and Argentina in terms of how corruption is viewed. In a show of largesse, the ambassador also had his kitchen prepare a sampling of Argentine beef served in three forms: tender roasts served thinly sliced with an olive oil and pesto sauce; empanadas filled with beef and green olives; and large pumpkins that had been hollowed out and were filled with a beef, potato and pineapple curry-like stew. To top it off, Wine Connection, a local retailer provided a sampling of Trivento wines from Argentina including a really nice reserve malbec. Not only was the movie enjoyable, but now I know where the beef is! 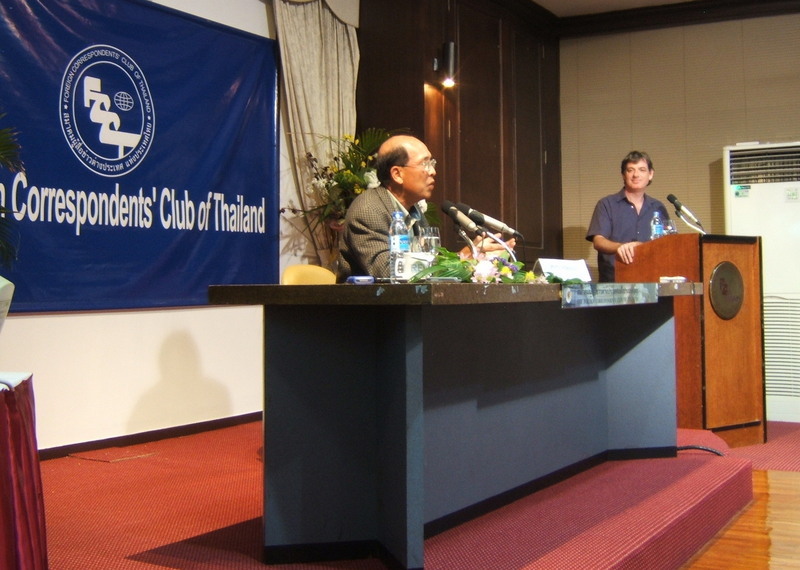 Tuesday evening I attended a special event at the Foreign Correspondents’ Club of Thailand where “The Man Who Banned YouTube” was speaking. Sittichai Pookaiyaudom, Thailand’s Minister for Information and Communciation Technology, made waves internationally when his ministry blocked access to the YouTube video-sharing website after videos deemed insulting to His Majesty the King were posted on this Google-owned website. Khun Sittichai is an unlikely Minister. By his own admission, he is a lousy politician and is just doing his duty to help the country during this transition to a new and hopefully elected government. 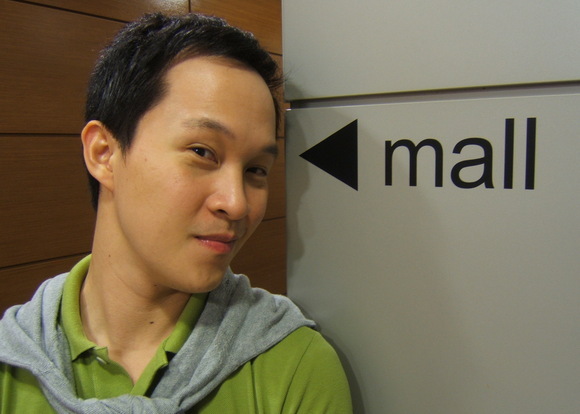 As an Australian-educated electronic engineer, Khun Sittichai claims not to have much use for the internet, although when questioned he showed a strong comprehension of the specifics about the internet when explaining why the entire YouTube site was blocked rather than the specific URLs of the offending videos. Right: Minister Sittichai and the moderator field a number of tough questions. Most of the evening was Q&A with Khun Sittichai using self-depracation and condescending and vaguely sexist and racist comments to avoid directly answering questions. By his estimate, only about 200 websites have been blocked in the six months since he was appointed, of which two or three are political websites. Those who protest the interim government provided a list of more than 17,000 websites they say have been closed down. One wonders where the real number lies. What was particularly interesting to me was the three Thai journalists who were there asking questions, including one man from The Nation. Their questions, and his in particular, were clearly coming from a point of anger and frustration with the coup government. I found it unprofessional when the reporter from the Nation began his question by saying he would not refer to Khun Sittichai as “Minister Sittichai” because that would require him to recognize the legitimacy of the interim government. While I can understand why he feels that way, it causes me to question how effectively he can write articles in The Nation if he is so clouded by anger. It was a good experience for me because the evening provided another view on what’s happening here in Thailand. It will take many, many more views to gain a better understanding and when I offer my insight about politics in Thailand, I try to make clear that my understanding is sophmoric at best. Yesterday was a teaching day. Since school has started again, Kobfa, Markus and Ken have been regulars with at least one of them every week. Yesterday it was Kobfa, Ken and I. While Kobfa was translating a report on a study Ajarn Yai conducted about integrating special needs children with the general students population, Ken took the more advanced 4th to 6th graders and worked with them on constructing sentences in the sala or pavillion by the khlong. The trip to Hong Kong continued and concluded nicely, although each trip is a learning experience and I learned on this trip that a balance needs to be struck that doesn’t have us running from one appointment with friends to another as that kind of wears Tawn out. On Saturday we met Edward and went for some shopping in Central. There was no specific agenda but Tawn hadn’t had the opportunity to do any shopping the previous weekend when he was here with his parents and other family members. 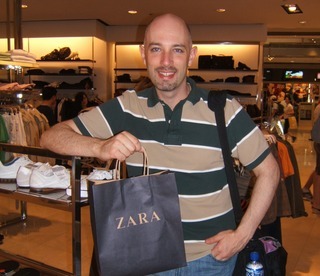 We went from store to store, buying a nice top for his mother at Marks & Spencer and then – shocking – I bought my first piece of clothing from Spanish retailer Zara, ever. This was so notable that Tawn took a picture. Famished, we climbed the hill to the Mid-levels for dim sum at Super Star Seafood on Wyndham Street. It was really good and our friend Dr. Chris finally showed up as we were finishing. He claims to be dieting because of two and a half kilos gained during a recent trip to Morocco. 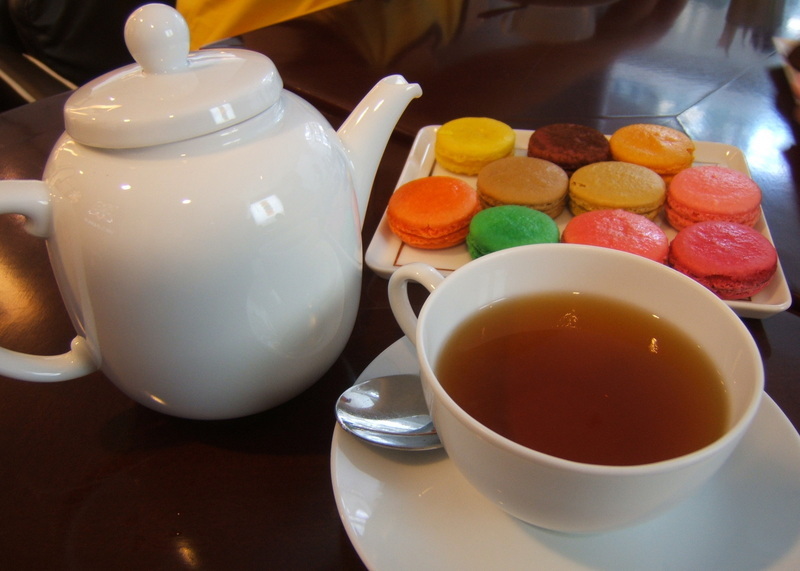 We did some more shopping, ending up at the IFC Mall where we had tea at Le Goûter Bernardaud, which specializes in a dozen flavours of Parisian style macaroons. Above: Tawn finds his bearings while we’re out shopping. Edward, Tawn and I enjoy a spot of tea. The multicoloured and very rich Parisian macaroons at Le Goûter. 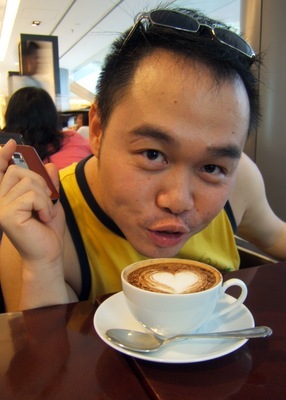 Edward plays with his latte. 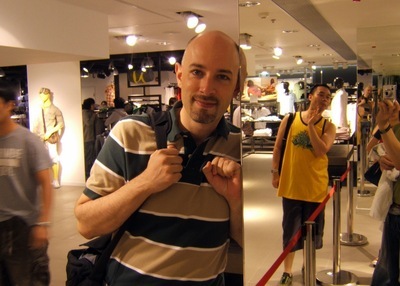 Chris waits patiently as Tawn takes a picture form the check-out queue at H&M. Late Saturday afternoon we took a cab back to the Mid-levels to see Dan and Kat’s new baby, Sophie Karima. (Above) She’s only twelve days old and is so adorable. It would have been nice to spend more time visiting but newborns have such a busy schedule: nap, suckle, bath, suckle, nap… No time for visitors! We were rushing back to Tsim Sha Tsui to meet up with Allan, who had come down from Guangzhou earlier in the day with his wife Valerie and their daughter Emilia. Of course I failed to consider the cross-harbour traffic on a Saturday afternoon and we were almost late. Thankfully, the taxi driver suggest just dropping us off at the Admirality MTR station and we just went the one stop on the train. 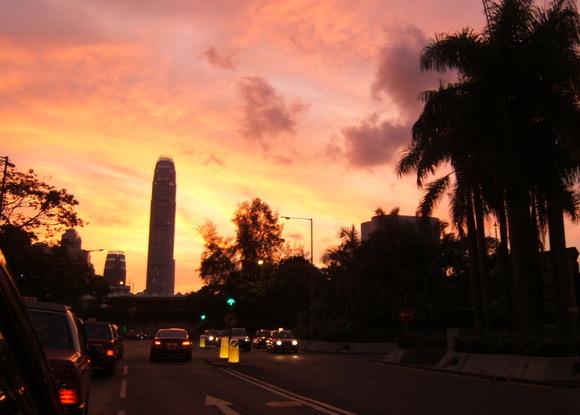 Below: Sunset as we drive along the Wan Chai section of Hong Kong Island. 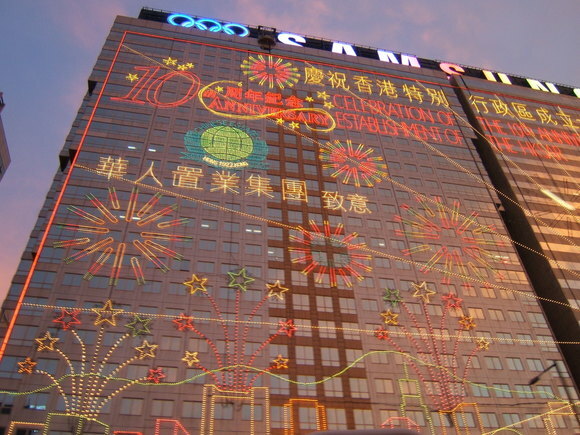 Above: The Samsung building is all decked out to celebrate the 10th anniversary of the handover of Hong Kong from Britain to China. The anniversary is July 1st. Valerie and Emilia stayed at Allan’s cousins, too sick to join us for dinner but we had a nice dinner at Chuk Yuen, where Tawn and I ate dim sum the previous afternoon. While the dinner was nice, we waited almost 90 minutes for a table with the hostess being continually vague about how long it would be. If we believed her, our table was being cleaned for more than thirty minutes. Sunday morning Tawn and I headed to the Jordan area of Kowloon to find a wet market. 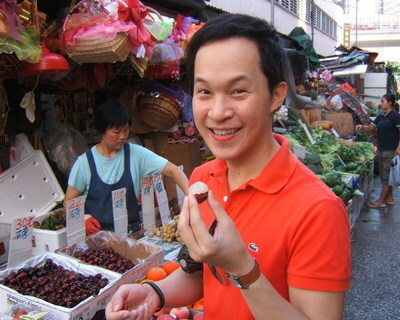 Tawn’s father had a list of things he wanted Tawn to bring back, including Chinese lychee, cherries, and bok choy, all of which are ostensibly better in Hong Kong than the ones we have in Thailand. Canned abalone was on the list, too, but we had already picked that up. Our final social event of the visit was another dim sum, this time at the very nice Peking Garden restaurant in Alexandra House, Central. 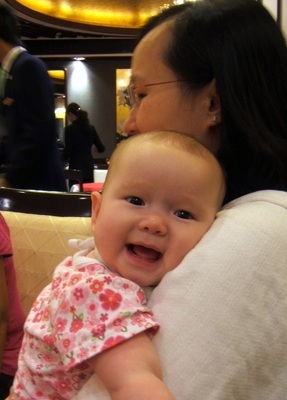 Valerie and Emilia were feeling better and joined Allan, and Tehlin had returned the previous day from Manila and had her infant daughter Isabel in tow. I really enjoy Peking Garden as the service is impeccable and the food is wonderful, especially the Peking duck. 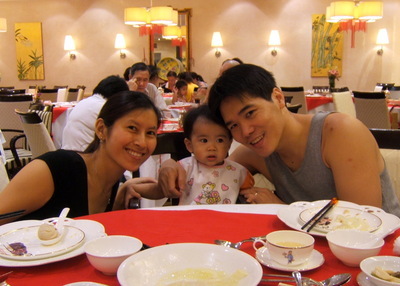 Above left: Valerie, Emilia and Allan. Right: Isabel rests on Tehlin’s shoulder. It occurred to me that the guests at the table formed a pretty accurate snapshot of the circle of friends I have, including a former colleague from San Francisco and his wife who are Chinese-Mauritian (of Hakka descent) and met and married in Montreal, Canada, returning from four months studying Mandarin in Guangzhou, China; and a former Chinese-Filipino classmate from Santa Clara University who now lives in Hong Kong with her Mandarin-fluent Australian husband and two children, talking about an Ethiopian meal I ate the last time I was in Montreal. A highly interconnected global circle. Right: Clockwise from top right, Tehlin, Tawn, Valeria and Emilia, Chris, and Allan. Our return flight was smooth and we were through customs before 8:30 and I was asleep before 11:00. Nice to be home in a king-size bed! 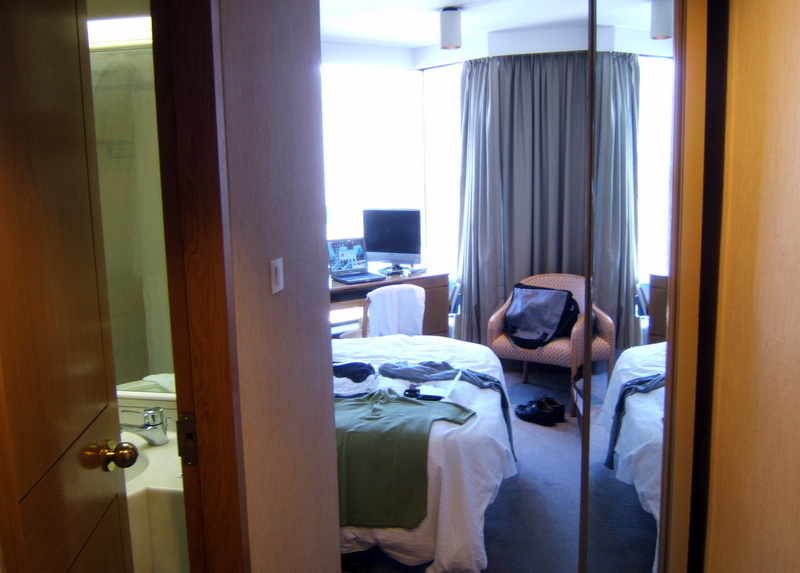 The Kowloon Hotel is a nice quality hotel with good service. We were able to get an upgrade to the club level floor, which includes breakfast, access to a lounge on the top floor, and some other services. While everything is nice, when we arrived in the room I was shocked by how small it is. The bed (the largest one they have, according to the front desk) is just a double. There is one foot of space on one side, two feet at the foot of the bed, and a very small space with an angled desk and a side chair between the bed and window. The picture to the above is taken with my back against the front door. I telephoned the front desk: “I thought we were upgraded? This is a tiny room!” They assured me that because of the floor plan, all rooms are the same size. The added services and amenities were the “point” behind the upgrade. While we don’t spend a lot of time in the room, still it is nice to have a little space to move around in since we’re a party of two. And a double bed? When’s the last time we slept in so small a space? Aie-yo. After the dim sum Friday afternoon, Tawn and I were stuffed and still quite tired from our short night of sleep Thursday. He wanted to walk around and do some shopping and knowing that I would just be a damper on his enthusiasm, I went back to the hotel room to take a nap. In the evening we took a walk along the Tsim Sha Tsui waterfront, where an “Avenue of the Stars” walkway has been built, honoring the legends of the substantial Hong Kong film industry. The walkway is right along the water starting by the Hong Kong Art Museum and continuing around to Tsim Sha Tsui East and provides some of the best views of Hong Kong Harbour. Below: I spent a good half hour playing around with different exposure settings, trying to get the two of us exposed while still allowing the skyline enough time for exposure. I ended up using an ISO of 100, 1.5 seconds at f2.9 with a delayed flash. We then took the MTR to the new Langham Place mall in Mongkok, meeting Michael at the Pure Yoga studio where he teaches. The transition of this area over the past decade is amazing. Mongkok used to be short-hand for gambling dens, houses of ill repute, and Triad violence. It wasn’t necessarily a dangerous place for tourists to pass through but it wasn’t a very good place, either. Many Hong Kong cop movies were set there (Raymond Yip’s 1998 Portland Street Blues, for example) because its reputation was so enshrined. With the opening of the very large Langham Place mall, which includes a hotel and office tower, the area has cleaned up, is lit like Times Square New York at night, and is now bustling will all sorts of legitimate business day and night. Michael says that the prostitution is still around, although it has pushed a few blocks away. Sooner than later, he suspects, it will be pushed out of this area entirely because the money to be had from high-end commercial developments is greater than the money to be had from a red light district. Dinner was at Wang Jia Sha, a Shanghainese restaurant on Shantung Street. Shanghainese cuisine is one of my favourites, especially all the different types of steamed dumplings. Before we knew it, midnight had arrived and it was time to head back to the hotel. Maybe Saturday night we’ll go out to find some nightlife. One more shot of one of my favourite skylines. We had a full day today, Saturday, which I’ll blog about when we return. Saturday morning at Starbucks in Hong Kong. It is a sign of how much things have changed in the Pearl of the Orient: when I lived here in 1998-99, there were no coffee shops in Kowloon and only a few on Hong Kong Island. There was a small (room for two seats) espresso stand in Tsim Sha Tsui just behind the Kowloon Hotel. Some mornings I would take the MTR all that way in from Kowloon Tong to have my coffee, then commute back up to Mongkok where AMC’s pre-opening office was. I should walk over and see if that coffee shop is still there, as we’re staying at the Kowloon Hotel on this trip. There are plenty of Starbucks and Pacific Coffees to choose from these days, though. Speaking of coffee, I decided on the occassion of my illness last Monday that I was going to kick this caffeine habit. I had made it to the point where each morning I was drinking two or three large mugs of coffee at home and often having another one or two cups during the course of the day. I’m not necessarily opposed to the occassional cup, but I shouldn’t be consuming that much each day. So far I’ve made it five days without any coffee. This morning while working on my laptop at Starbucks I did have a tall decaf latte, but I think the point is the caffeine, not the coffee itself. 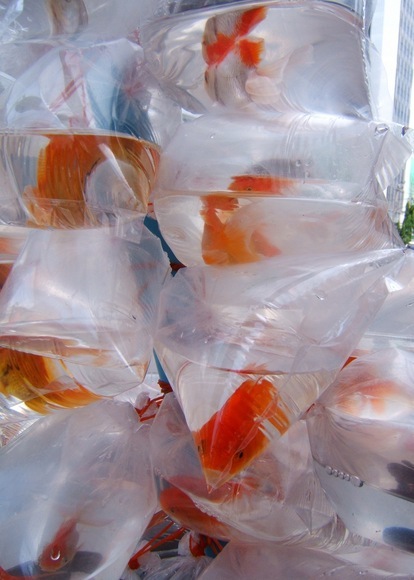 Right: An interesting pictures of the wares of a goldfish vendor. Dozens of bags are tied to a two-meter length of PVC pipe, which the vendor carriers down the street. Pity those poor fish, cooking in the noonday sun. We made it to Hong Kong yesterday morning with no difficulties. Our departure was 8:20, not unreasonably early, and our flight was on Cathay Pacific. 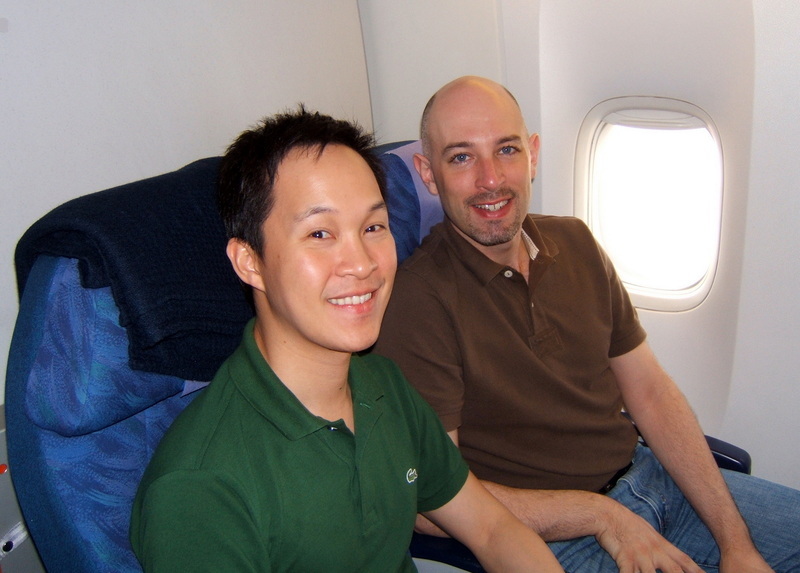 Cathay won Air Transport World’s Airline of the Year award in 2006 and I was keen to try their service. While only a little over two hours’ long, the flight was very pleasant. Attentive service, generous portions of good food, a wide selection of audio and video entertainment, and laptop power in the economy class seats. Yes! 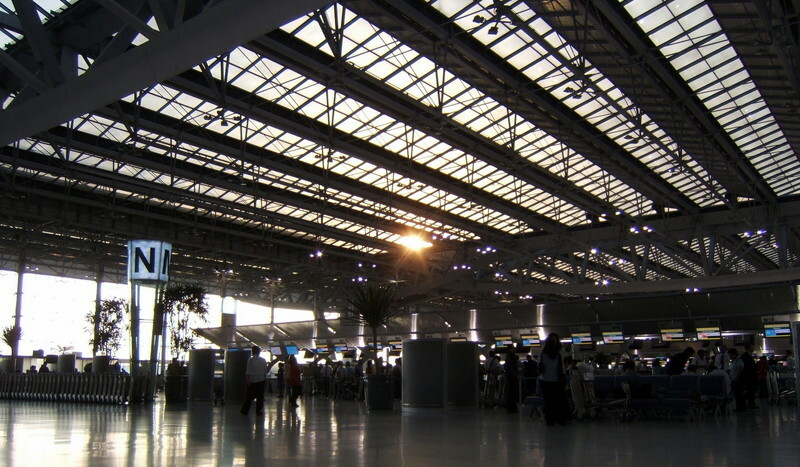 Below: The morning sun shines through the ceiling at Suvarnabhumi Airport. Tawn and Chris in the very last row of the plane. 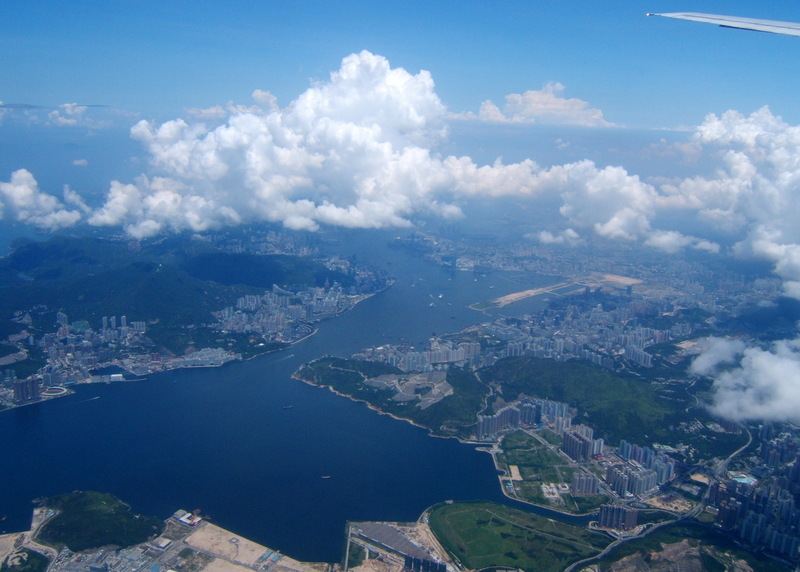 On the way into Hong Kong, we had a fantastic view of of Hong Kong Harbour including the old Kai Tak airport. 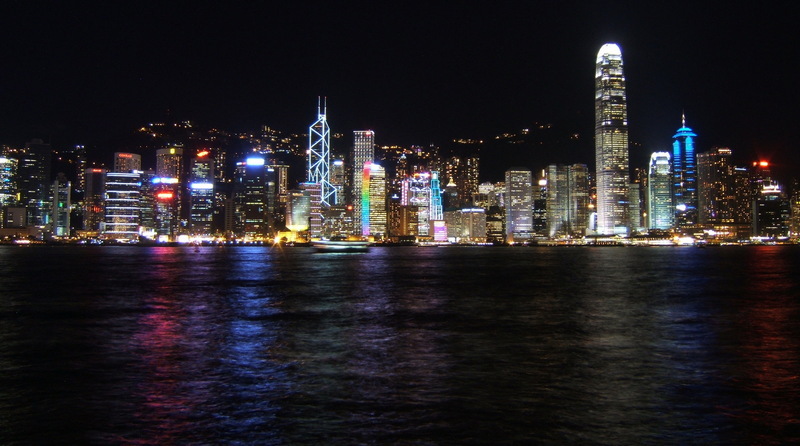 One thing I’ve always liked about Hong Kong is that the skyline is so picturesque. It really is beautiful. We arrived at noon and found long lines in immigration, but were through in about forty minutes. Part of our tour package included transportation from the airport, so we were riding in this mini bus with a dozen other people, all of whom were dropped off first. When we finally arrived at the Kowloon Hotel at 2:30, we were starving. We went for dim sum at Chuk Yuen Seafood Restaurant on Hankow Road, just around the corner from the hotel. Tawn’s aunt’s borther-in-law, who moved to Hong Kong from Bangkok about 50 years ago, brought them there last weekend. Despite being in a very touristy area, the place was filled with locals (at 3:00! ), the servings were generous and the ingredients very fresh. We were so full afterwards! I’ll wrap up the entry now, as Tawn should be waking up soon. More soon. A physically tiring week comes to an end a day early as Tawn and I head off to Hong Kong Friday morning at 8:30. This morning I spent a few hours helping Markus and Tam get their apartment packed. They move to a new place on Sukhumvit 10 on Saturday. I also finished printing their commitment ceremony invitations and envelope labels. All they have to do is tie the bows and stuff and stamp the envelopes. 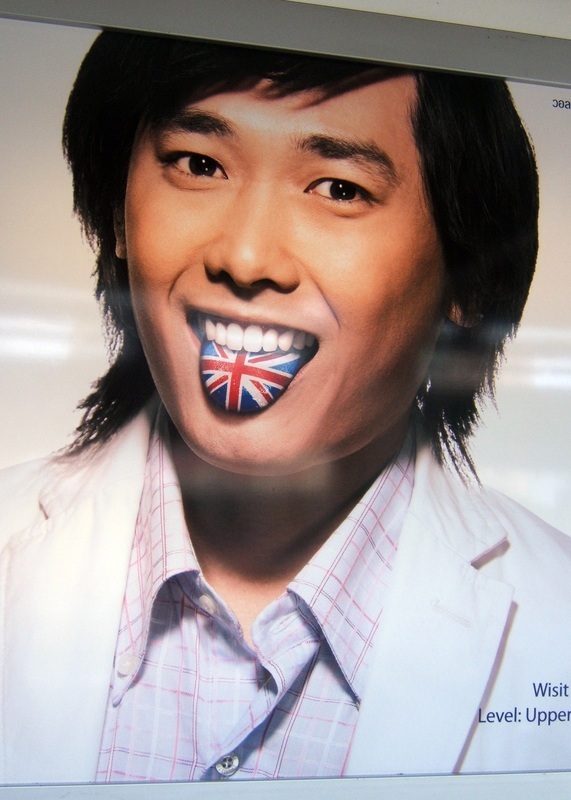 Right: Wall Street Institute, a local language school that advertises heavily, showing the importance of speaking “the local tongue”. All I can think of is the Rolling Stones. I’m looking forward to being back in Hong Kong. Too expensive for me to live there again, but one of my favorite cities. Or, to speak the local tongue, favourite cities.